Not only are UTV jamborees great ways to experience a region’s trails and scenery, they’re places to see the latest and greatest UTV products. You get to see the newest hardware and hear the features and benefits from company representatives, often months before the products make it to company websites. Here is the latest in UTV technology from rallies and expos we’ve recently attended. 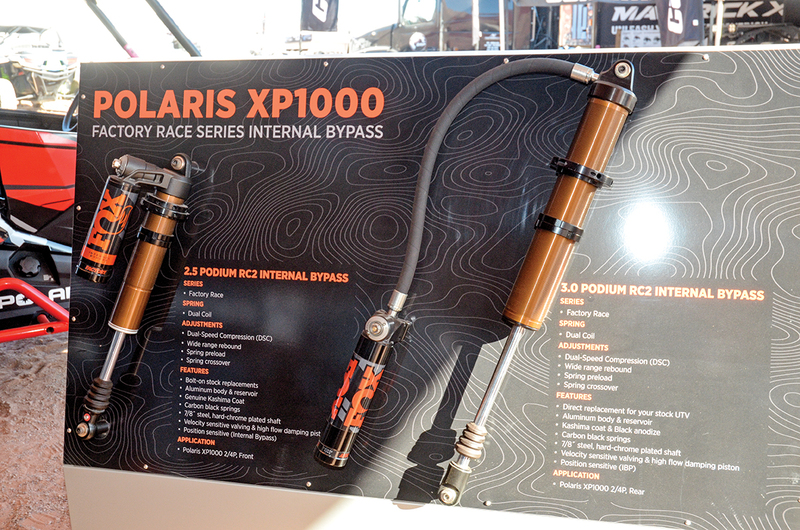 As cool as the Fox Podium Internal ByPass (IBP) shocks are for our Fox and Dynamix Edition RZRs, Maverick X3s and YXZ1000R/SS Yamahas, the Fox IBPs don’t have Schrader valves for rebuilds or adjusting nitrogen pressures. Assault Industries has designed billet-aluminum extensions that not only add the Schrader valve but add cooling fins, surfaces and shock-oil capacity for lower fluid temperatures and less fade. MSRP is $129.99 a pair; see your Assault dealer or www.assaultind.com. Walker Evans Racing introduces the all-new 501 Legend II beadlock wheel designed for optimum performance on today’s UTVs. Each wheel is made from high-pressure cast aluminum and machined for increased material strength with a smooth finish. Zinc-coated hardware on the bead-lock ring creates a bright contrast. The Legend II is available in Satin Black and Satin Grey in 14×6, 14×7, and 15×6 sizes for Polaris, Can-Am and Yamaha high-performance UTVs in various offsets. Weight is 17–18 pounds, depending on size, and MSRPs are $225 to $285 each. 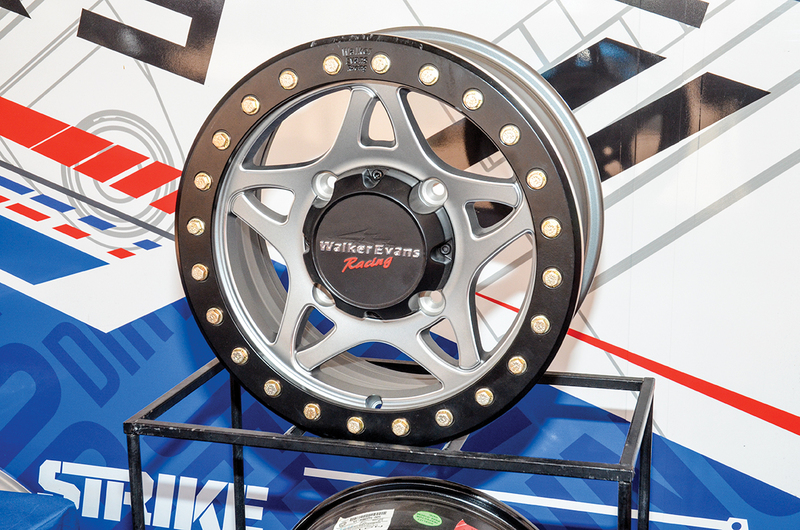 See your WER dealer or www.walkerevansracing.com. 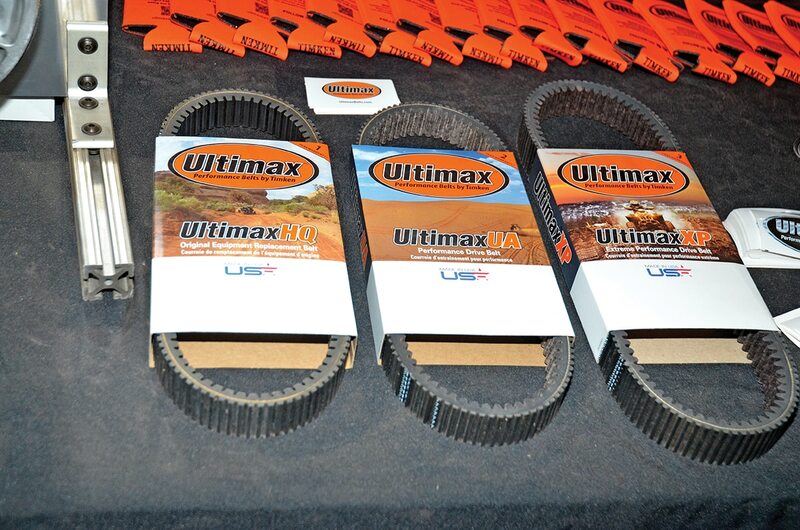 Timken enters the UTV market with Ultimax Xtreme Performance CVT drive belts. Engineered to take more abuse and loads than any other belt, Ultimax XP belts are constructed with advanced polymer compounds, Aramid cords and fiber-loaded rubber for extra grip on clutch sheaves and superior shock-load resistance. They’re manufactured using new high-tech processes. 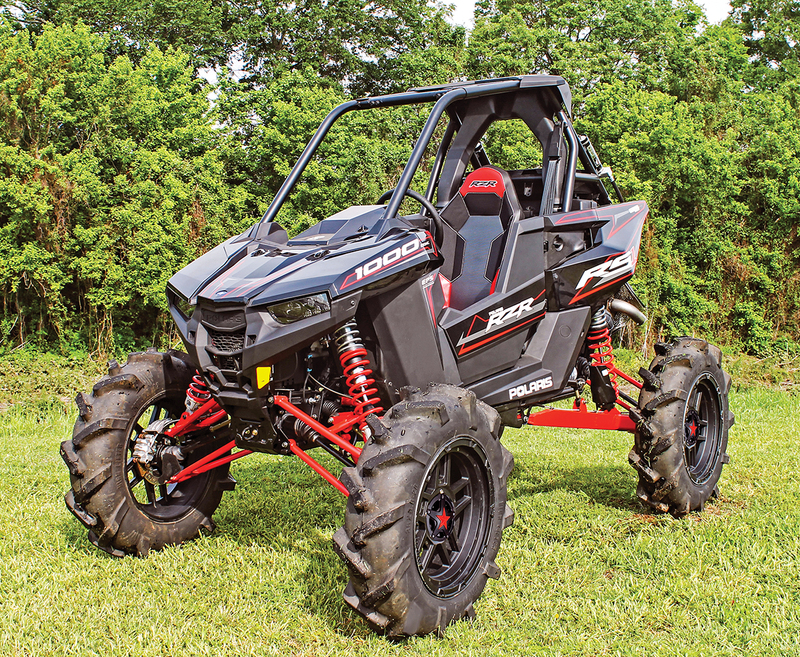 Current fitment includes Polaris RZR XP Turbo, 1000, 900, and 570; Ranger 800; Can-Am Mavericks; Arctic Cat/Textron Wildcat 1000 and 700 and Prowlers; Kawasaki Teryx and Mule 4000, 3000 and 610 series; Yamaha Rhino; John Deere Gators. They also have a 3-year warranty. MSRP is $89-$132. See www.ultimaxbelts.com. Based on Baja Designs’ legendary 8-inch La Paz HID, the new LP9 LED light has some of the most advanced LED technologies. The LP9 has nine forward-projecting LEDs that produce 11,025 lumens at 105 watts (Driving/Combo and Spot patterns), and six LEDs on the sides with Integrated Peripheral Technology produce 1,140 lumens at 10.5 watts per side. IPT provides an incredible 200-degree spread of light, and housings disperse heat with Direct Ducted Cooling. The LP9 also has a daytime running mode in addition to low and high power, and there are Racer and Sport Editions with tuned patterns. MSRP is $599.95 each (white) to $609.95 each; LEDs are expected to last 49,930 hours. See www.bajadesigns.com or call (800) 422-5292. 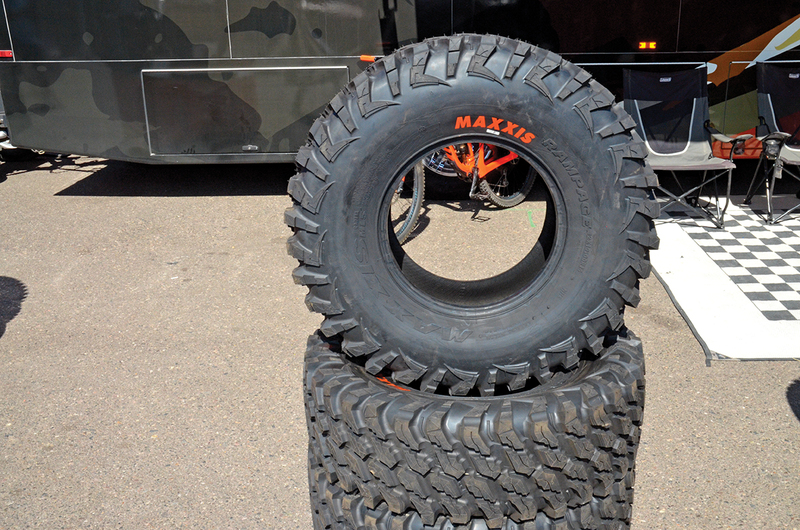 Maxxis introduces a new Rampage eight-ply radial UTV tire, inspired by a light-truck tire, for intermediate to hard-pack desert conditions. The Rampage has an aggressive tread pattern with stepped and siped lugs and a specialized rubber compound for superior traction and control. The Rampage is only available in 30x10R14 at present for 14×7 rims and is said to have exceptional tread life. MSRP is $265, but we found them online for $186–$195. GMZ Race Products unleashes its new Apex eight split-spoke wheel in an 18×7 size (5+2). The matte-black Apex is made to match GMZ’s King Kong mud tire ($289.95), and the cast-aluminum wheel is heat-treated for strength and backed by a lifetime manufacturer’s warranty. MSRP is $189.95 each. See www.gmzraceproducts.com. 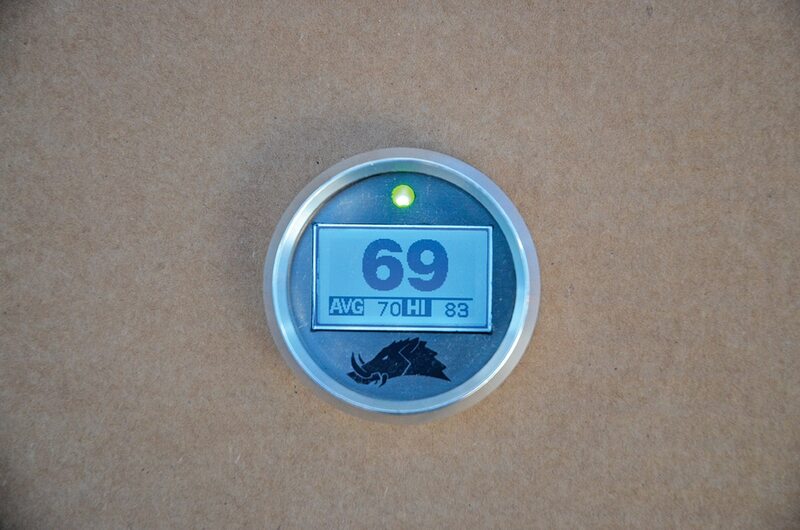 Razorback Technologies introduces its 3.0 infrared CVT-belt temperature gauge. 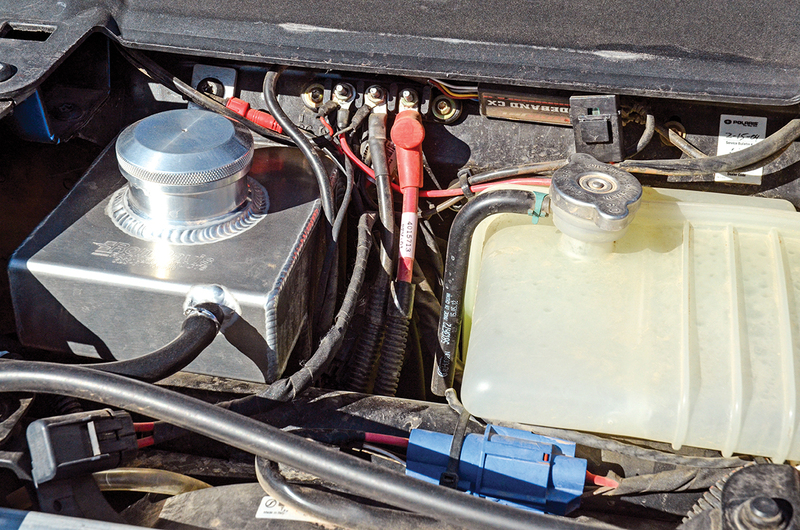 The 3.0 sensor adds a quick-connect wiring harness for disconnecting the sensor at the CVT cover, and the 2.0 version adds a non-glare LCD screen to the original Infrared temp sensor. All three versions fit a 2 1/16-inch gauge cluster, and they’re machined from billet aluminum and have a waterproof sensor for the CVT. Razorback 2.0 and 3.0 gauges display current, average and high belt temperatures and have multi-color LED alerts. There are also Standard and Pro Infrared sensors, with the Pro having a narrower field of view. 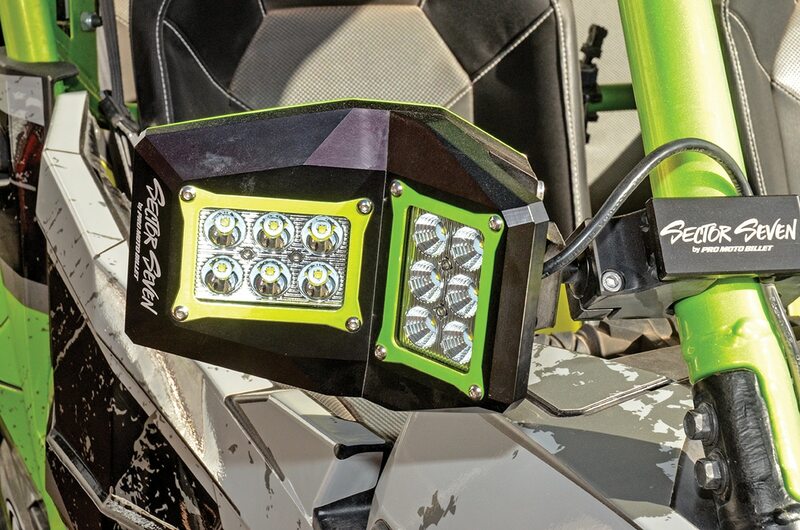 Rocky Mountain ATV/MC has them for $299–$309. See www.razorbackusa.com or call (888) 525-2858. 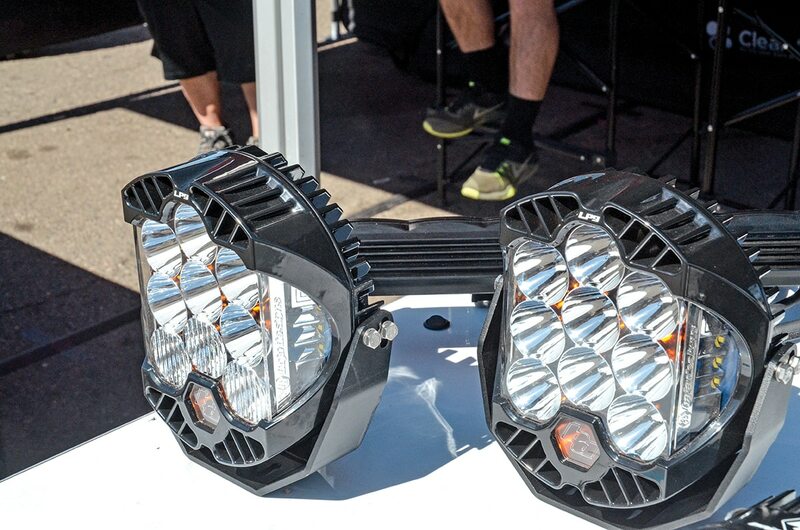 Fastway gets into the UTV market with Pro Moto Billet’s Spectrum Sector Seven UTV LED mirrors. A pair of normal convex side-view mirrors by day, Sector Sevens light up the night and provide plenty of side vision (210 degrees) for turning and not missing that upcoming side trail. CNC-machined from 6061 billet, the mirrors have unique clamps that fit any tube from 1.25 to 2.0 inches, and each has 12 LED bulbs producing 7200 raw lumens. MSRP is $799.95, and the wiring kit is $19.99. See www.promotobillet.com or call (866) 466-4762. 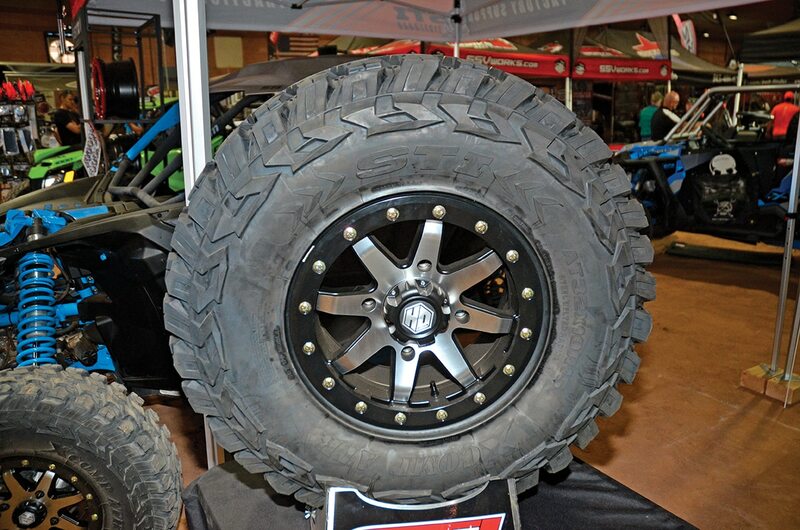 SuperATV adds a new 34×10-14 Warrior tire size, which joins the 32×10-14 and 30×10-14 sizes. The DOT-approved, all-terrain Warrior has a patent-pending tread pattern and dual Kevlar belts; it has 3/4-inch lugs in a tapered pyramid pattern with self-cleaning ejector ribs. The tread is also designed for low-vibration and low-noise operation on pavement, and the eight-ply carcass has built-in rim guards. 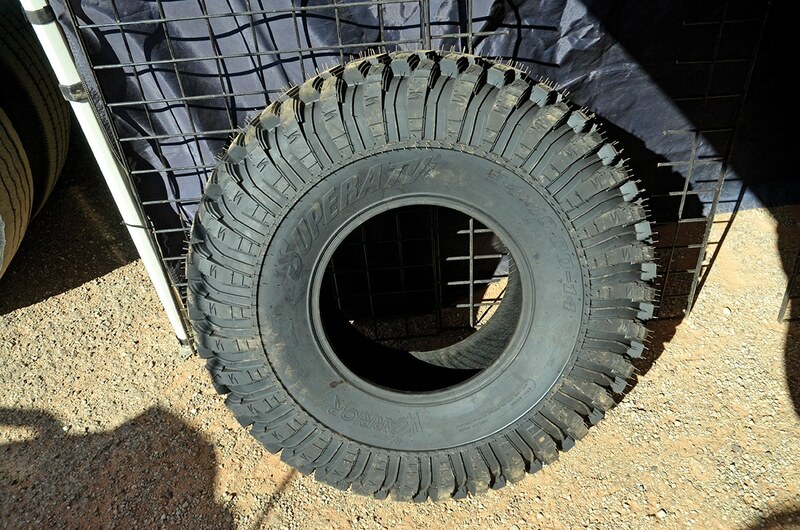 This all-terrain tire is also available in Standard and Sticky rubber compounds. 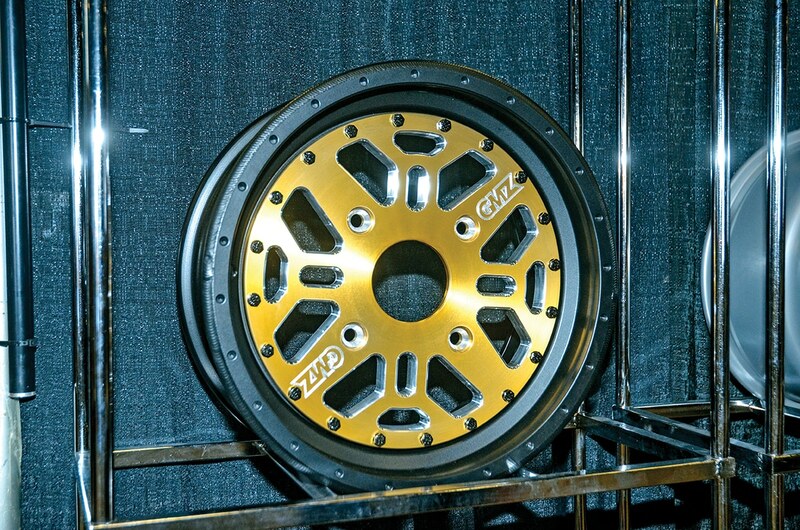 Price hasn’t been set for the 34×10-14, but the 30s and 32s are $244.95–$264.95. See www.superatv.com or call (855) 274-0665. STI’s new X-Comp ATR 10-ply, two-stage radial is both tough and smooth riding. The LT-inspired X-Comp has dual steel belts, a large footprint and multi-angle shoulder treads for massive traction in intermediate to hard conditions. Super steep and deep rim guards protect your wheels, and the rubber compound is durable for high mileage. X-Comps come in 28x10R14 ($202.19), 30x10R14 ($215.58), 32x10R14 ($235.99) and 32x10R15 ($245.65), and load ratings are 1,165–1,475 pounds each. Get them at your MTA Distributing or Motovan dealer or visit www.stipowersportscom. Add 4.5 inches of ground clearance to your RZR RS1 and allow the rear tires to roll out of ruts and over large rocks or logs with the High Lifter trailing arm kit. Crafted from DOM 1.5×0.25-inch steel tubing to retain the OEM driveline and suspension angles, the trailing arm kit also works with any lift kit and is a simple bolt-on, with the arm’s main bar running parallel to the frame for added clearance. MSRP is $689.95 a pair in red, black, lime, orange, silver or Velocity Blue. Should you ever need to tow a lesser machine out of the muck, High Lifter’s Rear Tow Hook plate adds a solid anchor, and it beefs up the radius-rod mounts. MSRP is $79.95. 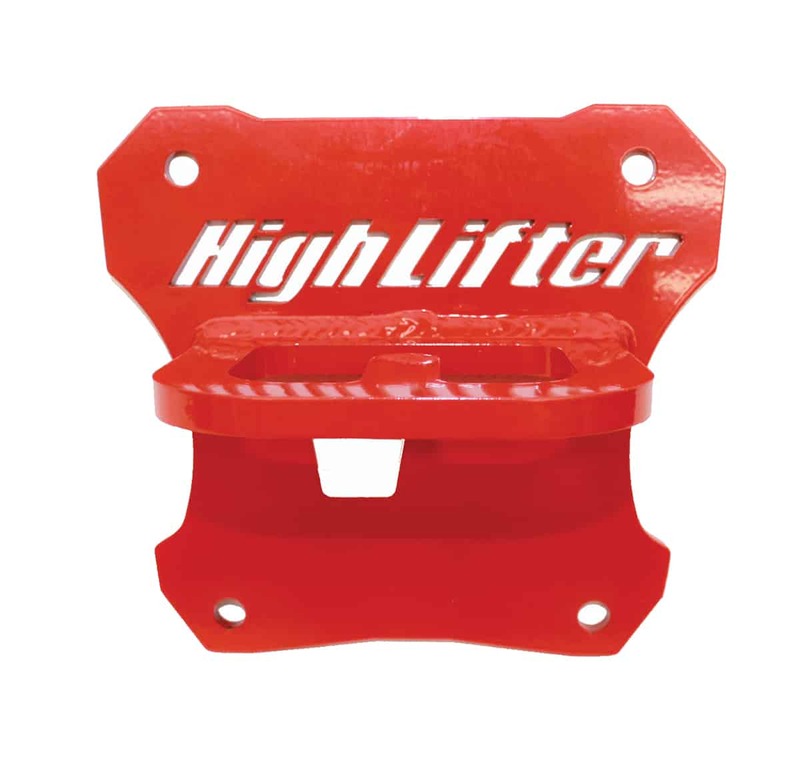 See www.highlifter.com or call (800) 699-0947. Beef up your lower radius rods and gain ground clearance with High Lifter’s Max Clearance Series radius bar, which is made of 1.25×3/16-inch DOM steel tubes instead of the OEM 3/4-inch or competitor’s 1.0-inch bars. The simple bolt-on kit has 5/8-inch Heim joints with a load rating of 17,955 pounds and polyurethane bushings for $214.95. High Lifter also has upper radius bars made of the same oversized tubing and 5/8-inch Heim joints for added strength for $194.95. 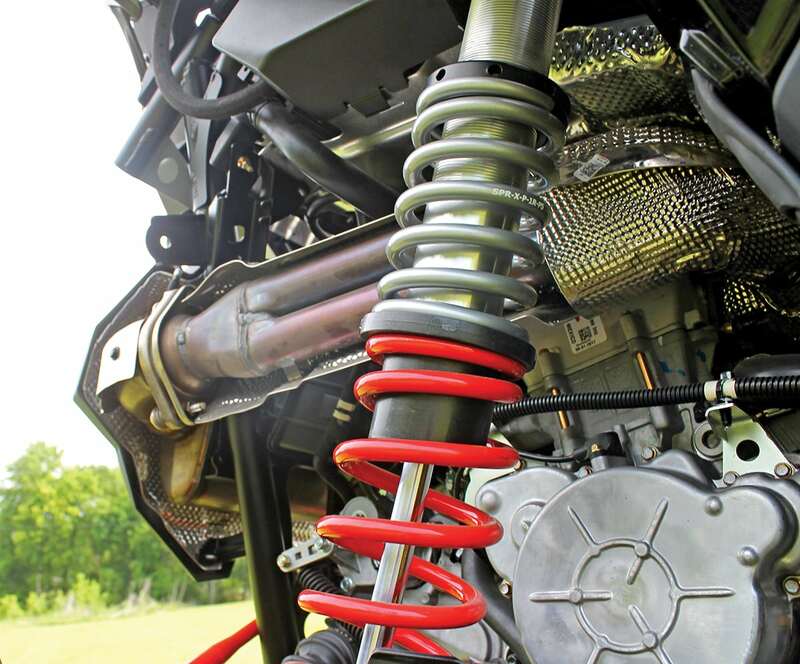 High Lifter has replacement kits for the front and rear tender springs on the RZR RS1, which are coil-bound at ride height and act as top-out springs. The High Lifter tender springs are longer for a true dual-rate spring setup (but don’t include cross-over rings) to improve ride quality, and they can be set to add up to 2 inches of lift by themselves or with any lift kit. Front kits are $139.95 a pair, and rear kits are $164.95 a pair. These kits and the other HL RS1 kits also fit the RZR XP 1000 and XP 4. 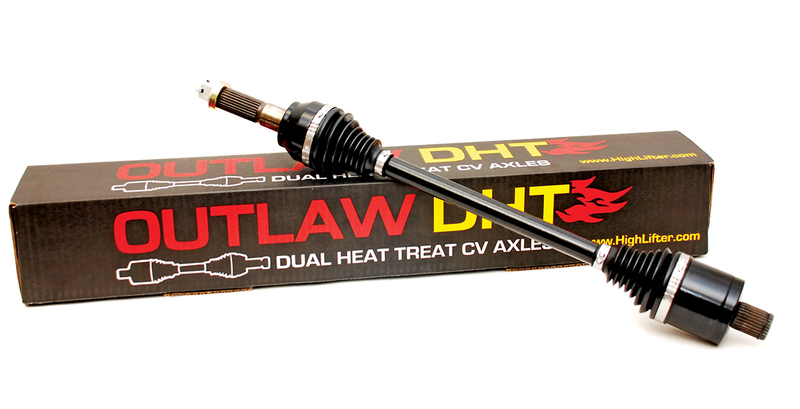 Armor your RS1 driveline with High Lifter Outlaw Dual-Heat Treated (DHT) axles, which also feature Thermoplastic Polyester Elastomer (TPE) CV boots for greater puncture resistance, oversized CV joint housings and low-profile double-wrap boot bands. Housings and bars are made of 4340 chromoly steel and are double treated against shock loads. Even the grease is high-grade Mobilev high-temperature, low-friction, synthetic polyurethane CVJ for cooler-running CVs. That’s a lot of armor at a low price of $229. 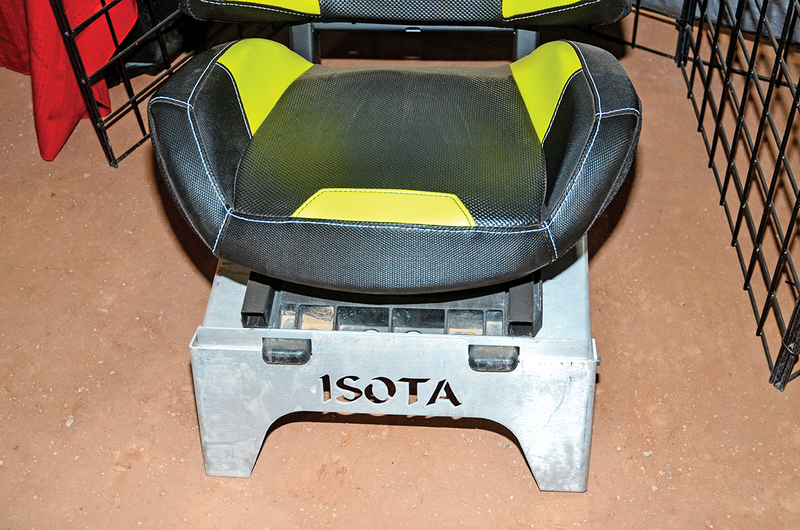 Isota Off-Road specializes in outfitting UTVs for adventure and exploration, and the new Isota folding RZR seat base lets you turn your seat into a camp chair. The aluminum base folds for storage behind the seat or in the bed, then it folds out to form a locking base for the OEM or aftermarket RZR seat. Isota also has aluminum cargo boxes, roofs, cargo racks, muffler covers and Rotopax accessories. MSRP is $59 each (or $100 a pair rally special). Made in the USA. See www.isotallc.com. When Turbo pressures and air-charge temps build, your ECM will pull back timing and lose power. Dynojet’s Intercooler Coolant Expansion Tank (ICE-T) isolates engine and intercooler coolants and yields lower and denser air-charge temperatures, whether you’re running stock or elevated boost pressures. Keep your 2016–2018 XP/XP 4 Turbo running at full strength, and you can drop a bag of ice in for even more dense air charges and power. The ICE-T kit comes with an aluminum tank, fittings, hose and hardware for $499.99. 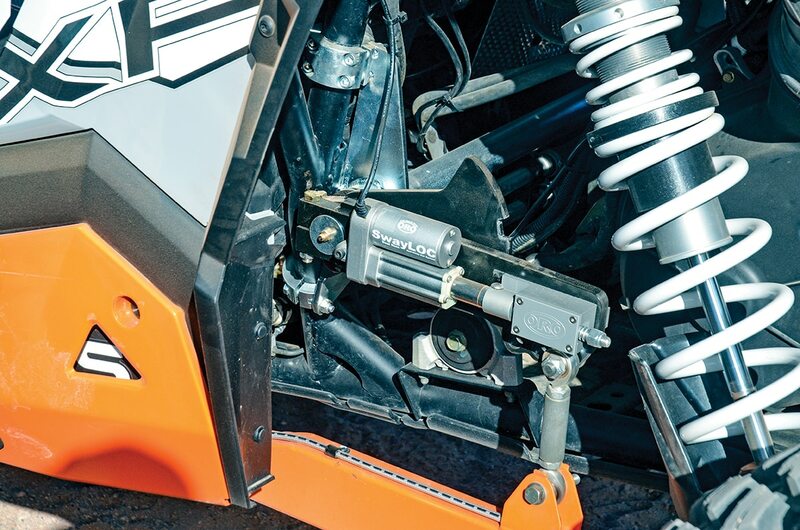 Dynojet is all about wringing the most power possible out of UTVs with Power Vision flash/fuel tuners and data loggers, and now Dynojet upgrades RZR XP CVTs with Dynojet clutch kits. New clutch arms have ports for adding or subtracting magnetic weights to the primary clutch to achieve optimum rpm and peak power. 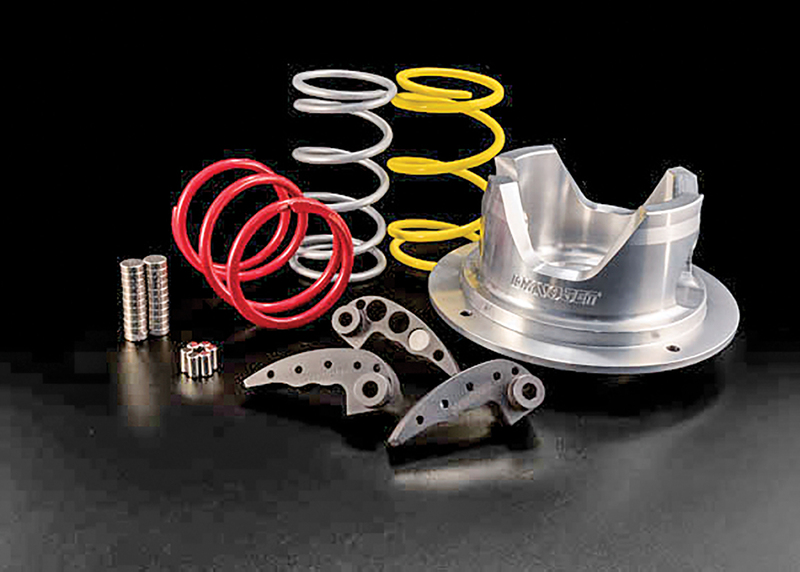 The RZR kit also includes a redesigned Helix and springs to decrease belt temperatures and wear and optimize shift rates for more rear-wheel horsepower. Dynojet also promises faster back-shifts and smooth engagement on XP1Ks, Turbos and XP 4s for $299.99–$399.99. See www.dynojet.com. 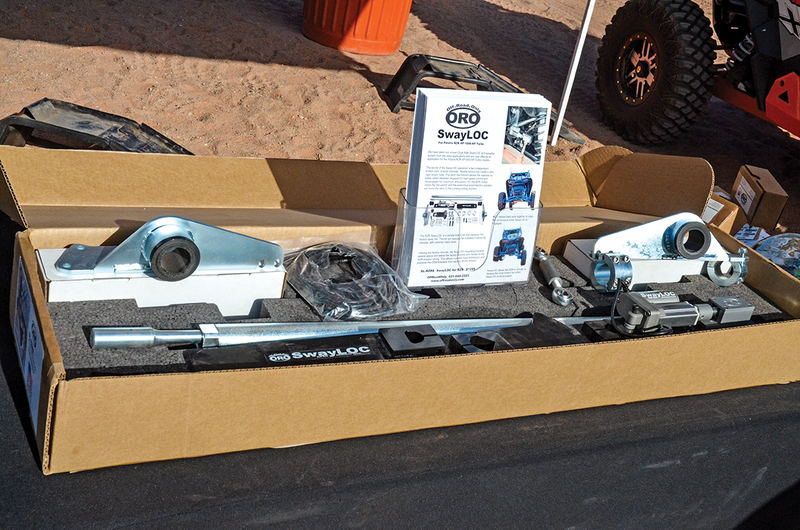 Off-Road Only (ORO) has been producing Jeep SwayLOC systems for 15 years, and now ORO has a new dual torsion-bar SwayLOC for RZR XPs. The simple bolt-on kit replaces the OEM rear torsion bar and mounts to the stock mount but also clamps frame tubes for more strength. 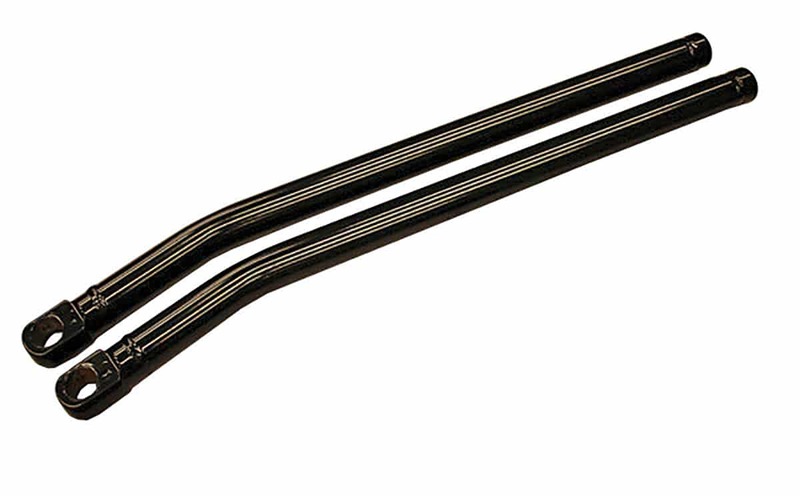 An inner torsion bar runs inside the very rigid outer torsion tube. Huge SwayLOC arms have three-position tuning for mounting links, and one arm has a latch mechanism that locks into place for high-speed control or disengages on the fly for maximum articulation when needed. The RZR XP/XP 4 kit includes all mounting hardware, including a toggle switch and wiring for $1249. See www.offroadonly.com. 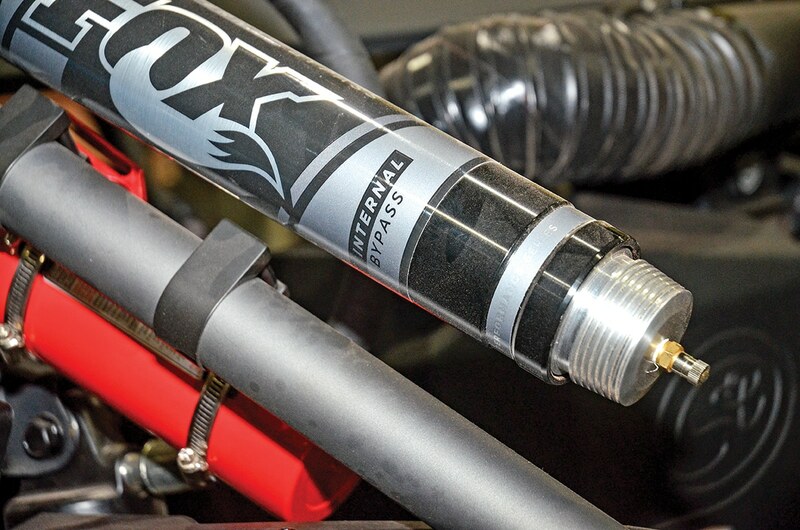 Upgrade your XP1K’s (or Turbo’s) suspension with Fox Factory Race Series 2.5 front piggyback Podium RC2 IBP and rear remote-reservoir 3.0 Podium RC2 IBP shocks with true dual-rate springs, cross-overs and Dual-Speed Compression (DSC) plus rebound adjustments. Factory Series shocks also have Kashima coatings, carbon-black springs, 7/8-inch steel shafts, high-flow pistons and both velocity-sensitive valving and position-sensitive IBP ports. RZR XP front 2.5 IBP Factory Series are $2,197.50, and rear 3.0 IBPs are $2,797.50 a pair. They also fit XP 4s and the new RZR RS1, and Fox also has Factory Race Series IBP RC2s for Maverick X3s ($4999 for four).